Hi friends! Today I am going to share one of my favorite activities for my two-year-old, Jaxson, that helps with his Sensory Processing Disorder. I like to call if the Dinosaur Dig! Both of my boys have SPD, and while my oldest son Max has a more intense version of the disorder, Jax’s SPD really affects his eating. For Jax, certain textures really bother him, particularly things that feel slimy or wet like diced peaches or gelatin. His Occupational Therapist recommended this activity a few months ago, and I’ve found it to be great for both of my kids. For toddlers who have SPD and feeding issues, getting them to touch an object and experience different stimuli they aren’t fond of increases the chances that they will eat the food. If they aren’t willing to touch a food, they surely definitely will not put it in their mouth and eat it! 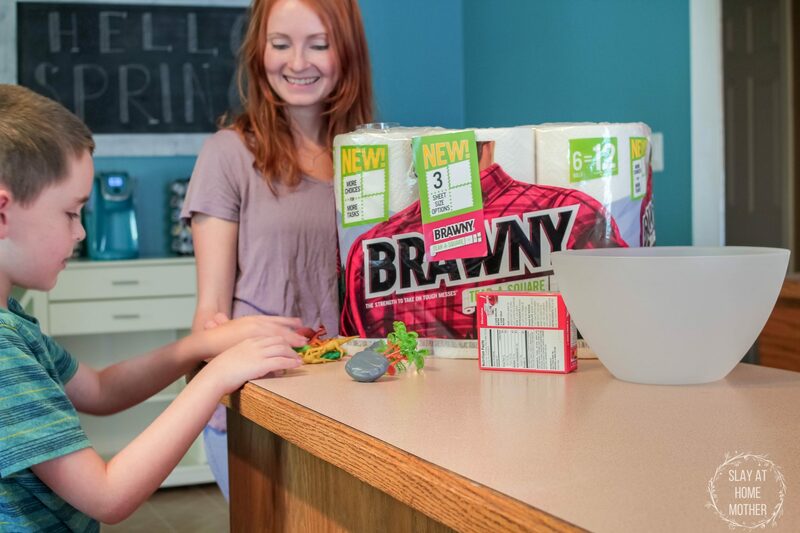 When it comes to our messy sensory activities, I love using Brawny® Tear-A-Square™ Paper Towels to help keep our mess contained to just our play area and not our couches, walls, or clothing. Although, for this activity, it’s probably best your toddler wears no clothes at all ;). 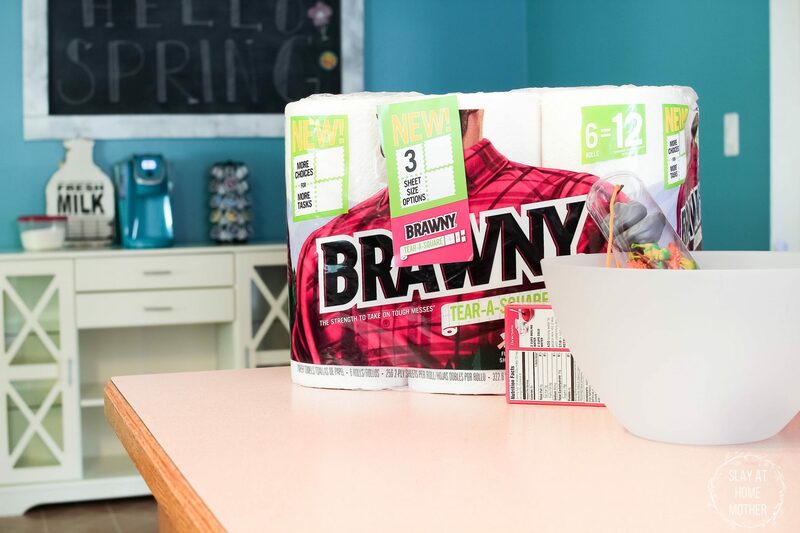 We snagged our Brawny Tear-A-Square at Target, because, well, we’re always there! 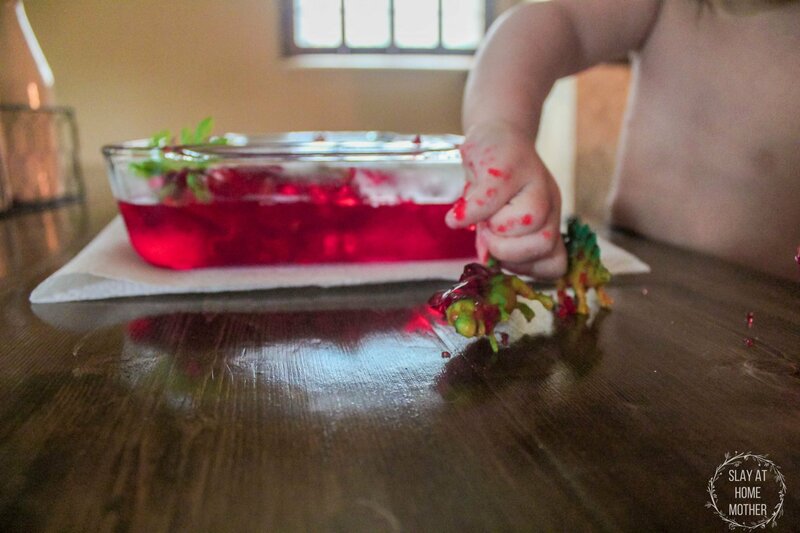 Since gelatin is one of those slimy textures that Jax doesn’t care for, we love to use it for sensory play! I simply mix up the gelatin according to the directions, pour in about half of my mixture, and add some toys in. After chilling the gelatin in the refrigerator for a couple of hours so that the first layer is firm, I add the rest of the mixture to our container along with more toys. This way all of the toys aren’t at the bottom, which can be really discouraging for little ones who need an instant reward to want to keep going for those bottom toys! These dinosaurs, which we also picked up from Target in their dollar section, are perfect for this type of layering. I love being able to tear one square from the Brawny Tear-A-Square roll to rest my mixing spoon on, and select the custom size of paper twoels I need to place under my gelatin baking dish while pouring. Brawny is a great brand to have on hand because their paper towels are 2-ply, with 256 quarter sheets on each roll. 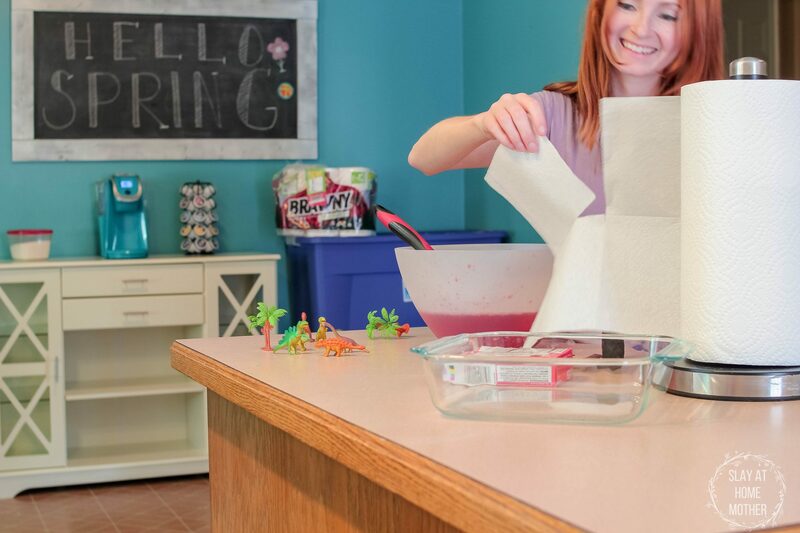 You better believe all those sheets sure come in handy with our messy SPD activities! When we first start with a sticky or slimy activity, Jax fights me on it. Everything inside of him is screaming to get away from this particular stimuli. After much coaxing, reassuring, encouragement, and patience – he was finally ready to sit and explore. 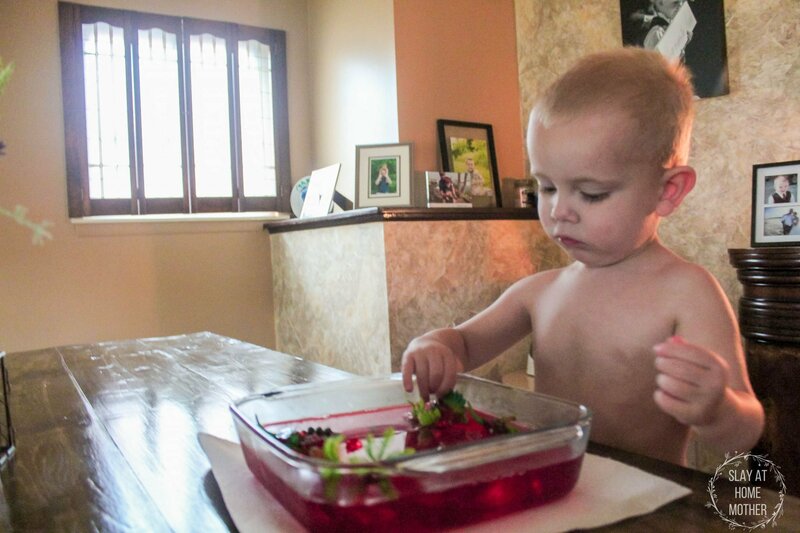 I showed him how to dig with his fingers and a spoon through the gelatin. With his SPD, Jax requires me to wipe his hands off after each exploration attempt, so our Brawny Tear-A-Square really came in handy. I kept a roll next to us the entire time, and loved that I was able to select just one square to wipe his messy fingers off. Towards the end of our play time, I demonstrated eating a little bit of the gelatin for him. I offered it to him, and even showed him how to lick his fingers. After a little time had passed, he finally tried it and loved it. Of course, we needed to wipe his hands off again with our Brawny Tear-A-Square! It makes me feel so good to be able to get him involved and excited about an activity that helps him in a healthy way, while also being able to clean up our mess quickly. 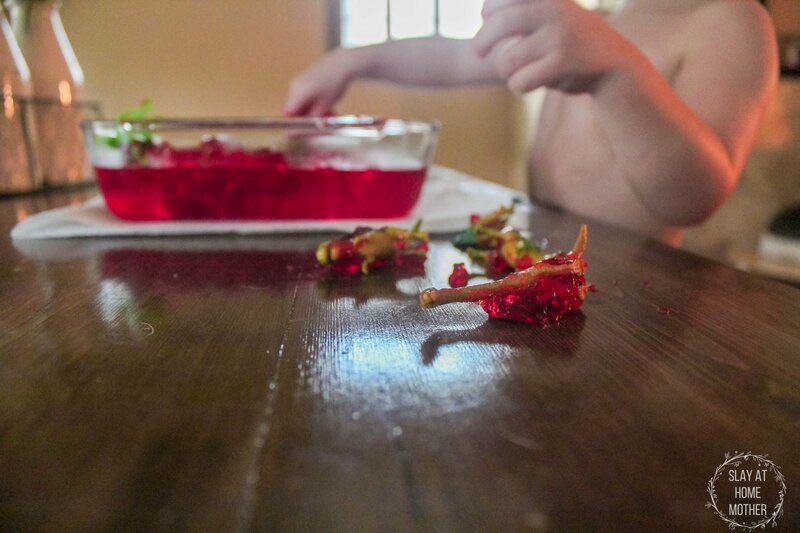 With our Brawny Tear-A-Square, I cleaned up the red gelatin mix from our dining table, the bench, and the floor with ease. Brawny paper towels are strong, durable, and can handle all our of kitchen, bathroom, and play time cleanup needs. And with these kids of mine, there’s always plenty to clean up! Selecting the size of paper towels I need also helps keep our grocery bill down since the roll lasts longer and no paper towel is wasted. 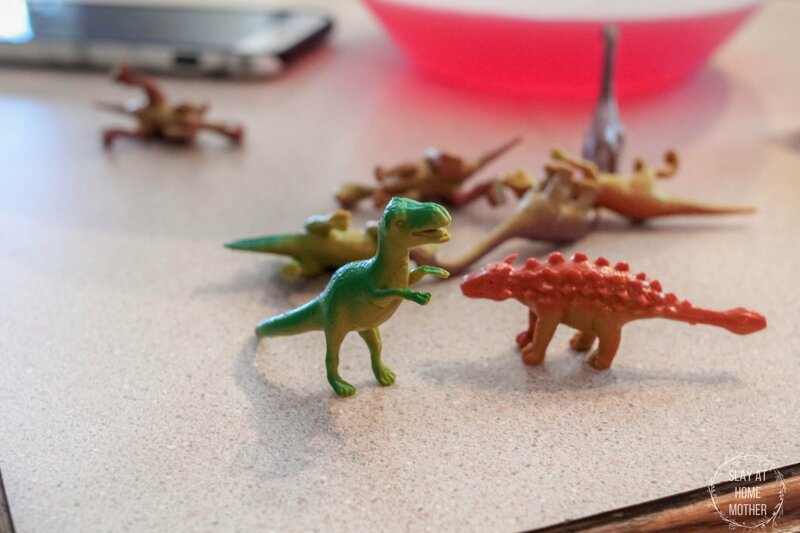 So that was our Dinosaur Dig sensory play activity that is super easy to do and clean up! 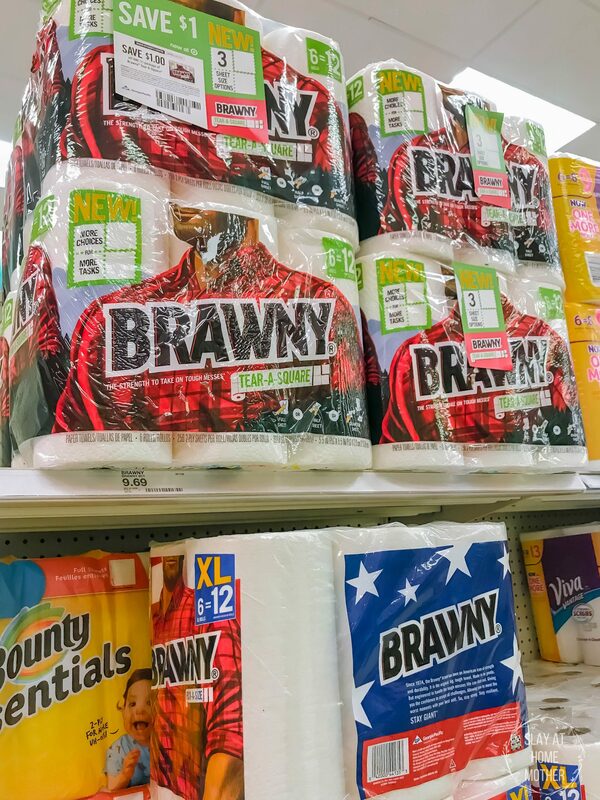 Hover over my image below to find Brawny® Tear-A-Square™ Paper Towels near you!